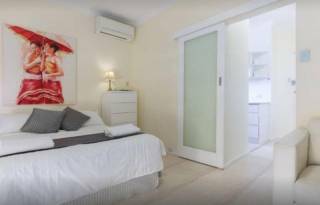 A newly renovated, beautifully appointed one bedroom studio apartment, fully furnished, self contained and is self serviced is available for short to medium term rental. The living area has an extendable sofa, flat TV, DVD player, CD player and a work station. Dinning area has table and four chairs. Kitchen includes hot plates, microwave, fridge and a front loader washing machine. The queen bed is privately situated and linked to the bathroom. R/C air-conditioning. Situated in a security complex with swimming pool and spa, lockable communal laundry and bike storage, also a covered car bay. It is on the second floor accessible by stairs with a lovely view of the tree lined street and park. This short term accommodation apartment is well located, looking out over Rosalie Park and the beautiful Kings Park parklands, is near Sir Charles Gairdner Hospital, Hollywood Hospital, St John of Good Hospital Subiaco, King Edward Memorial Hospital, Princess Margaret Hospital and the University of Western Australia. It is just minutes to restaurants, cafes and shops in the local Shenton Park Shopping Centre (in the same street), and only 1km to Subi Central and 3.5km to Perth’s city centre. Ideal for those who want to feel at home upon arrival and have much more comfort and space than a hotel room. Short-term rental in newly renovated 2 bedroom, 2 bathroom townhouse with secured double garage and alfresco courtyards. Located in a quiet, prestigious residential area opposite Rosalie Park and beautiful Kings Park, 10 min drive to CBD, 5 min drive to Swan River and UWA. Stylish living suitable for executives, consultants and holidaymakers who want to fully enjoy their rental in Perth and at the same time feel at home right on arrival. Accommodation consists of a queen bed in master bedroom and twin share in the second bedroom. There is also an occasional bed in the master bedroom that would comfortably sleep a child. Short-term rental, luxurious, newly renovated 2 bedroom, 1 bathroom townhouse with secure double garage and spacious courtyard. Located in a quiet, prestigious residential area opposite Rosalie Park and beautiful Kings Park, 10 min drive to CBD, 5 min drive to Swan River. Close to Sir Charles Gairdner Hospital, Hollywood Hospital, St John of Good Hospital, The University of Western Australia, just minutes to restaurants, cafes and shops in the local Shenton Park Shopping Centre. Stylish living suitable for executives, consultants and holidaymakers who want to fully enjoy their rental in Perth and at the same time feel at home right on arrival. Accommodation consists of Queen bed in master bedroom and twin share in the second bedroom. Undercover parking provided for 2 cars. PLEASE SUBMIT A BOKING REQUEST FOR ACCURATE PRICES AND AVAILABILITY! 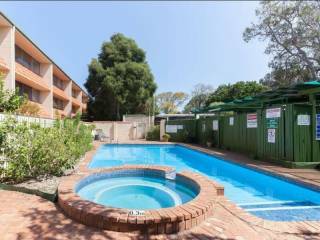 All of our short term accommodation properties are located in the beautiful leafy suburb of Shenton Park in Perth, Western Australia. Just a short walk from the eclectic streets of Subiaco, minutes from Sir Charles Gairdner hospital and Kings Park and Botanic Gardens, our properties provide a ‘home from home’ for individuals, couples or families looking for short term accommodation Perth. Perth, the gateway to Western Australia, is the most remote city in the country. Despite this, it succeeds in attracting the big names on the international music circuit as well as world-class performers in theatre and dance. With leading universities and the brand new QEII Medical Centre and Sir Charles Gairdner Hospital (all just a stones throw from your short term accommodation), Perth continues to produce some of the best new talent of each generation. Stay Perth manages three ‘home from home’ properties in Shenton Park. Furnished with everything you need to make your short term stay comfortable, our accommodation will have you settled and relaxed in minutes. Whether you are looking for a holiday break, on sabbatical from the university, on placement at the hospital, visiting for treatment, or relocating to Perth, our accommodation has everything you need to make you feel at home. The quiet streets and open parkland make it hard to believe that this accommodation is just minutes from the city. Our executive studio provides accommodation for two people in the main bedroom with a sofa bed in the lounge for a third guest or child. 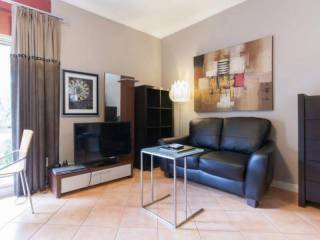 With one bedroom and one shower, this short term rental accommodation is located on the upper floors of a the well protected complex. There is undercover parking for one car and access to the complex swimming pool and spa. Our Shenton Park executive studio accommodation is perfect for those looking for a short term stay in Perth. Many of our guests have commented on the easy access to all that Subiaco has to offer despite the sense of being tucked away in a quiet and secluded space. Newly renovated accommodation in Shenton Park, these townhouses provide short term accommodation for four people but with room and facilities for a fifth guest if required. With two bedrooms, secure double garage and spacious courtyard, these townhouses are popular with families or couples looking for short term accommodation Perth. Located off a quiet, leafy street, with all that Shenton Park has to offer just a step from the doorway, our townhouse accommodation is furnished with everything you need to make your stay comfortable. The City of Subiaco is a short 12-minute walk from our accommodation. Home to specialty food, home ware and fashion shops, Subiaco is a vibrant suburb for young and old alike. With cinema, live theatre, bars and restaurants, Subiaco is the place to be seen both day and night. Make the most of the Subi Farmers Markets and buy your fresh produce to cook back in your accommodation, or put your feet up and visit one of the many restaurants and bars dotting the area. We will contact you via phone or email with check-in instructions once your booking fee has been received. The non-refundable Booking Fee/Bond/Deposit $200 is required on the day of booking. Full payment has to be made seven days before arrival if not otherwise arranged with the Property Manager. Cancellation or re-booking has to be made seven days before check in. In the case of cancellation the management will try to re-book the accommodation, and you will be refunded the portion that we are able to re-book (minus deposit). If the re-booking was unsuccessful one week's rate will be retained. •Via PayPal: You may send funds internationally very inexpensively using PayPal – visit www.paypal.com to find out more. You need to add 3% on top of the invoiced amount to cover the fees so that we receive the correct amount. If you don’t already have a PayPal account, it is free and does not take a minute to set one up. The funds are sent immediately. Please leave the property clean (except linen), and report any breakages or equipment which does not work. The GUEST SURVEY form is provided in the WELCOME kit, where you can put those information as well as your satisfaction with the property and any suggestions how to improve it. Any damage done during your stay and extra cleaning-needed cost, will be taken from the bond. For the staying longer than one week, weekly cleaning could be provided at guest's payment. •The best way to come to Park Vista Executive is by taxi or if you are renting a car use GP or your mobile map. There are lot of works going around Perth Airport at the moment and Changes are happening on a daily bases. •Our Office/Home is at 22 Onslow Road Shenton Park. Please first come there to register, if not otherwise organized with the Management. One covered parking No41 is allocated to this apartment. Located off street – accessible from rear lane way.